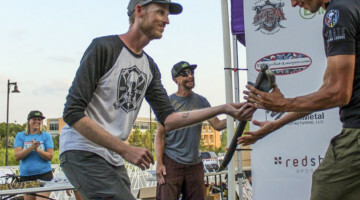 When Cyclocross Magazine heard cyclocross was going to be part of the 2017 CrossFit Games, we knew we had to get to Madison to cover this unique event. We quickly changed our plans for the week, hit Priceline.com and … just kidding. Your humble Cyclocross Magazine editor lives literally two blocks from Quann Park and the Alliant Energy Center where the Games are being held, so it was a no-brainer to go check out the scene. I first learned that cyclocross would be part of the CrossFit Games when someone tagged our Instagram account with the video of a rider running over a set of four barriers. I recognized the kit of the Waterloo-based 801 W. Madison team and soon realized the rider was Bryan Fosler, a local Cat 1 ’cross racer. I knew the CrossFit Games were coming to Madison, but I had not really paid attention to the date. Turns out, #crossfitishere. 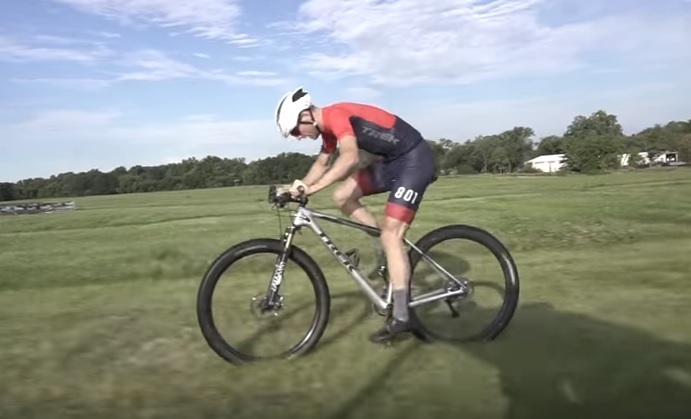 The preview video featuring Wisconsin cyclocross hero Bryan Fosler was a hint something was afoot at Quann Park this week . YouTube screen capture: CrossFit. Admittedly, I am a sucker for elite-level competition of any kind and go all-in on watching and trying to pick up on some of the nuances of whatever sport it might be. 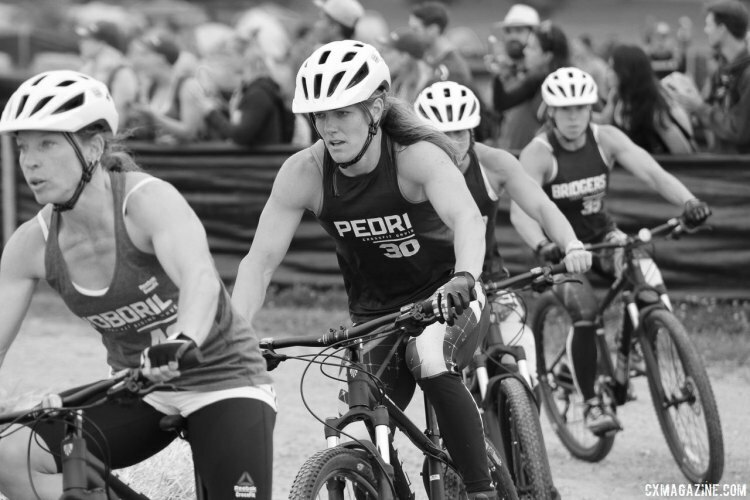 Watching athletes who devote their lives to excelling at a sport and competing at the highest level makes for compelling viewing, and thus it only made sense for Cyclocross Magazine to get an inside look at the CrossFit Games cyclocross race. 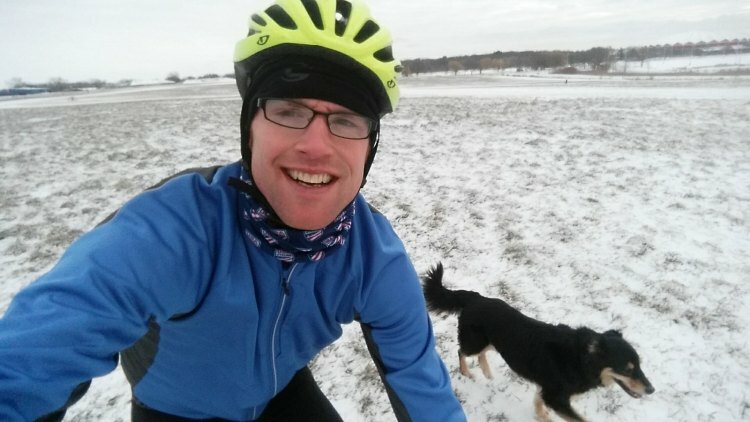 The CrossFitters are not the first athletes to ride cyclocross at Quann Park, which is one of the many dog parks in the City of Madison. My girlfriend Amy (mostly) and I take her dogs to Quann park to ride around on our cyclocross bikes to get them some exercise and maybe work on some ’cross skills. I will leave it up to the reader to decide if this constitutes real cyclocross since it was in the snow, not mud, and my bike has an aluminum frame and v-brakes and I was running 40mm clincher mountain bike tires, and also, I am pretty sure Hank and Watson do not have valid USAC licenses. Like any cyclocross rider who has spent more than two minutes at a park, I have thought about Quann as a cyclocross venue, and I will be honest, there is not much there to work with. It is an open field with maybe one hill along the side and a gentle slope throughout much of the grounds. 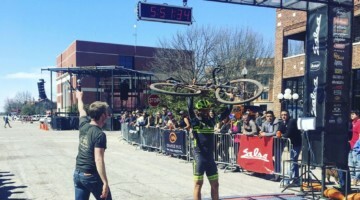 However, it does fit the important criteria of being adjacent to the Alliant Energy Center (there is nowhere else within miles to host a cyclocross race) and as we saw from the live stream, it made for a TV-friendly production. Any cyclocross race organizer can tell you that you have to work with what you have. Despite these challenges, Wednesday and Thursday’s course at Quann Park had several of the hallmarks of a cyclocross course, including barriers, a sand pit, two sets of logs, downhill chicanes and a few sketchy gravel corners. 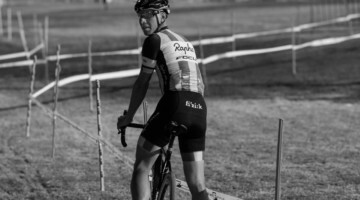 For many cyclocross racers, barriers can become a bit of an afterthought, but for folks watching for the first time, it is usually the barriers and features like the sand pit they usually end up noticing and asking about. Would a lot of us have been bored to ride on that course? Probably. Did it still have features that made it distinctly cyclocross, even if the course was aimed at beginners? Again, I will leave that up to the reader to decide. 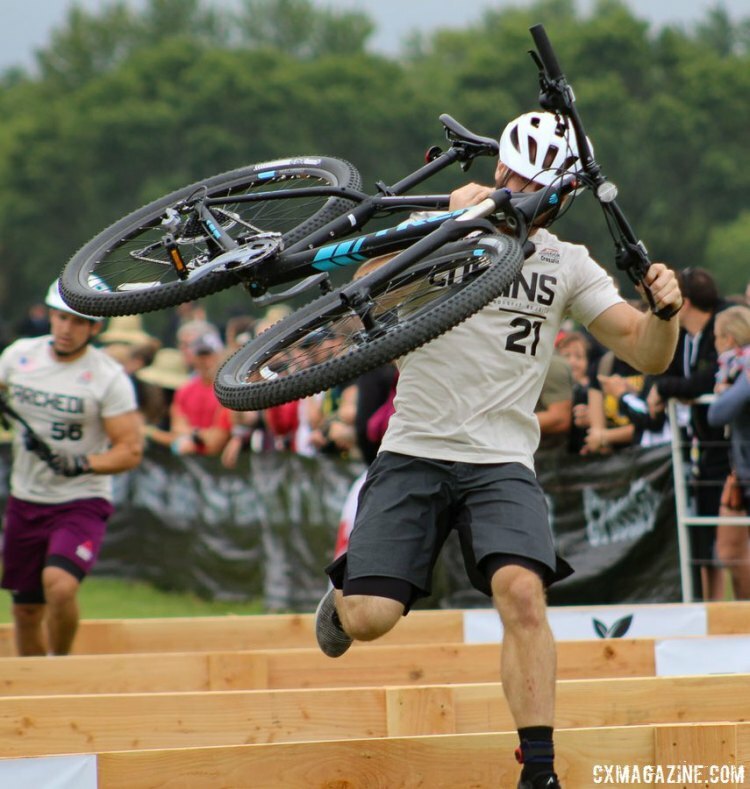 Over the course of the CrossFit cyclocross festivities, some of our readers pointed out on social media that the CrossFit athletes were riding mountain bikes and not cyclocross bikes. I did some investigating while on site at Quann Park and learned these commenters were correct; the bikes were Trek X-Caliber 7 mountain bikes. A huge stable of bikes was required for the CrossFit Games. Heats were run one after the other during Thursday’s races, so upwards of 50 bikes were needed to keep things running smoothly. 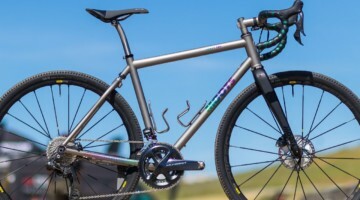 I would guess it was easier for Trek to provide 50 identical mountain bikes than Trek Crocketts, and the mountain bikes were likely more resilient to crashes and other mishaps beginners can suffer. 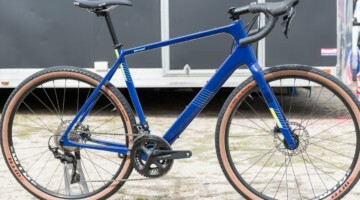 During post-race interviews, most CrossFit athletes said they had done their pre-Games training on mountain bikes, so the choice of the X-Calibers also provided some familiarity for the athletes that allowed them to focus on tackling the cyclocross course and not have to worry about riding drop bars and dealing with Shimano or SRAM road shifting. The 28-pound X-Calibers had the added bonus of adding an extra CrossFit strength component to the barriers and sand. 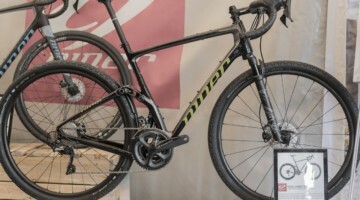 For what it’s worth, I talked to one of the Trek mechanics after Thursday’s event, and he said at least two of the athletes enjoyed their X-Caliber cyclocross experience so much they wanted to buy the bikes they raced on. 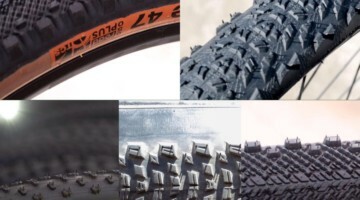 Additionally, the official position of Cyclocross Magazine is mountain bikes can be the best bikes for beginners because they are often the off-road bike most people have on hand and the wider tires and handlebars can provide a more confident ride for first-timers. I will be the first to admit I do not know much about CrossFit. While still incredulous our humble little sport was going to be included in the CrossFit Games, I reached out to one of my acquaintances who played a big role in bringing the Games to Madison and she said, “CrossFit is about being ready for whatever.” Although we do not compete in the wide variety of events CrossFit athletes do, this sounds an awful lot like the cyclocross mentality. We race in heat, cold, snow and mud on whatever course the race organizers have laid out for us. 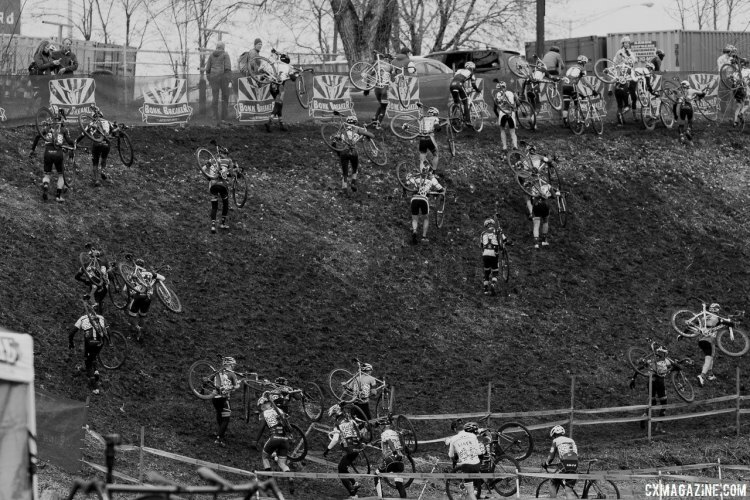 Whether it be a “grass crit” or the World Cup course at Jingle Cross, we have to be ready to race the course, and no matter the course, it is still a bike race. My acquaintance also warned me that athletes who participate in sports that CrossFit crosses over into can get really snarky. I have admittedly directed my fair share of snark toward triathletes during my cycling career, but I have come to realize that cyclocross itself is a pretty silly sport—carrying bikes? running over barriers? costumes? giraffes?—and have learned to appreciate people finding their sport and devoting their free time to excelling at it, no matter how goofy it may appear at times. Am I ever going to do CrossFit? No, probably not, but I think it is awesome there are so many people who have found a supportive community and push themselves to achieve more and try new things. 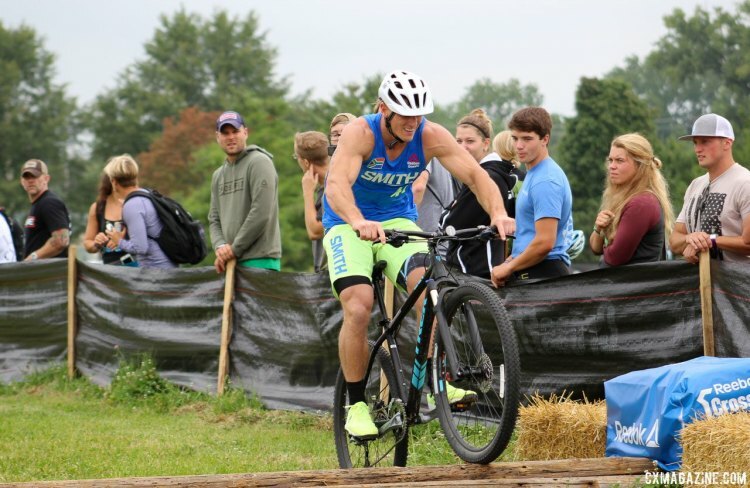 On Wednesday, the CrossFitters got their first opportunity to try out cyclocross during their preliminary heats. They got to ride a couple of practice laps and then do a one-lap time trial for their call-up position on Thursday. The first thing to note about Wednesday was it was hot. 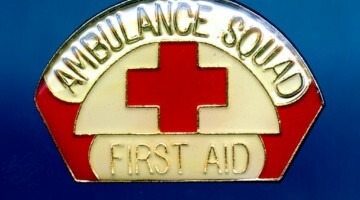 The temperature was at least 80 degrees mid-morning and was pushing 85 or 90 when the qualifying heats ended. Despite the heat, there were no complaints about having to try a foreign sport in such warm conditions. 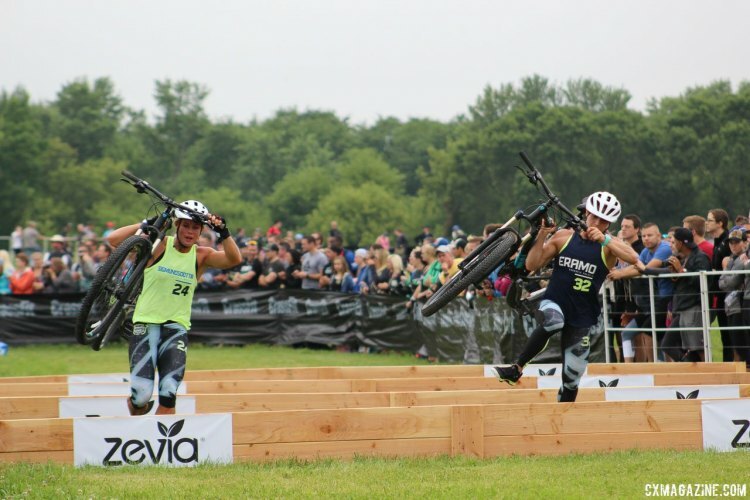 My biggest takeaway from Wednesday’s event was how the CrossFit athletes totally embraced their cyclocross experience. They went out and gave 100% to this niche discipline of cycling they have never tried before. Some riders were obviously more prepared for the challenge, but all of them were out there tackling the barriers and attempting to ride the logs regardless of the outcome on the other side. I knew #crossishere when I heard the familiar sound of athletes entering the proverbial pain cave and breathing deeply as they ran through the sand and tried to sprint away on the other side. Only athletes were allowed in the venue on Wednesday, so the crowd was about the size of a good local Wisconsin cyclocross race. Despite the novelty of cyclocross, the CrossFitters watching the event adapted to the sport quickly by congregating around the barriers and sand pit like happens at most ’cross races. The small crowd was cheering for all the riders and offering tidbits of advice I have heard at countless cyclocross races. “Higher gears on the straightaways! 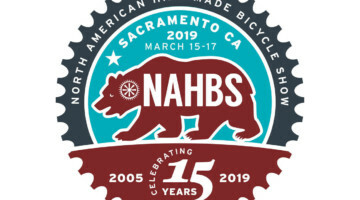 Careful on the gravel turn!” I have learned first-hand how sketchy the gravel at Quann can be and there were numerous deceptive false flats, so this should not be discounted as cyclocross advice. I still remember my first cyclocross experience vividly, even though it was almost five years ago. I took my bright orange 26″ Surly Instigator out to Heistand Park in Madison to tackle the hilly, slick Booty Cross course during pre-ride. 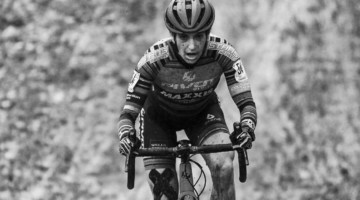 The other riders were continually apologizing for how hard the course was, but all I was thinking was “This is a thing I need to do.” I would upgrade to a cyclocross bike the next year, but I still remember the pure joy I felt the first time I rode on a ’cross course, even on my obsolete mountain bike. Lingering around the athletes after their first time trying out cyclocross, I could not help but note some of that feeling of happiness that comes with riding cyclocross permeating the air. It was fun! It was hard! It was scary! 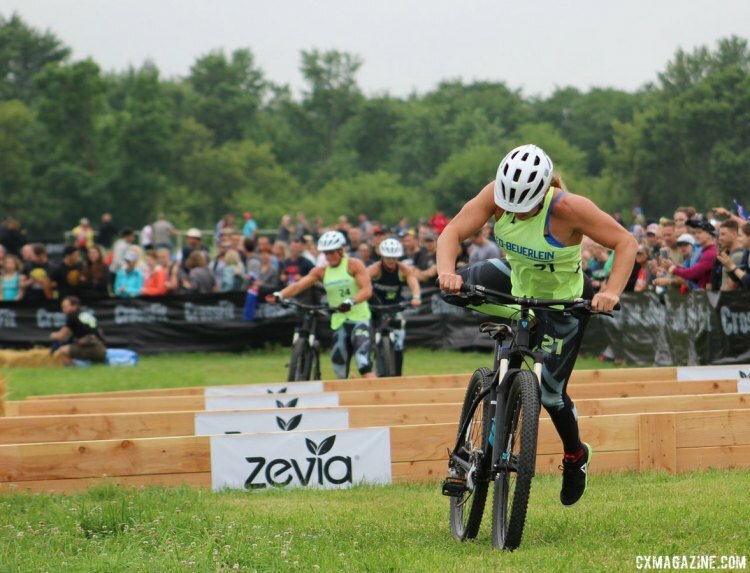 These feelings are the reason we love cyclocross, and it was an awesome experience to see these elite CrossFit athletes share some of the exhilaration (and temporary pain) that leaves ’cross racers forever dreaming of the mud and ruts of fall. When I was getting ready to commute the two blocks to Quann Park on Thursday morning for the CrossFit Games cyclocross races, I saw this Instagram photo from Trek mechanic Josh McKinney and was excited about what the day had in store. CrossFit organizers said they expected 60,000 spectators over the weekend, but with the rain and the weekday slot, I was curious what kind of crowd would come out for the cyclocross race. If Wednesday was a local Wisconsin race, then, as Josh pointed out on Twitter, Thursday’s crowd was transported straight from Namur or Zolder. Fans were everywhere at Quann Park, lining the the start/finish, barriers, sand pit and other sections of the course with easy fan access. There was little beer drinking, few flags and cowbells and a lot more workout clothes, but they were loud and engaged and cheering for every athlete from start to finish. If an athlete struggled with a remount there were words of encouragement and cheers when they gave their remounts a second shot. One aspect that was decidedly un-European was the crowd cheered just as loud for the 20th rider in each heat as they did for the 1st.
.@CrossFitGames CX commentary, "You wanna look down+to the inside of the corner". No, definitely not, only if you wanna take a bad line. I thought they did an admirable job calling the action of a sport they have not announced before and enjoyed their efforts to inject some cycling strategy into the commentary. CrossFit’s professionalism was evident throughout my two days at Quann Park. Tim Chan, whom I interviewed for background on the event, was a gracious host and was more than accommodating despite my late request for a press pass. The judges were literally running to their spots to make sure everything worked on time, and the course was set up to maximize quality live stream coverage. 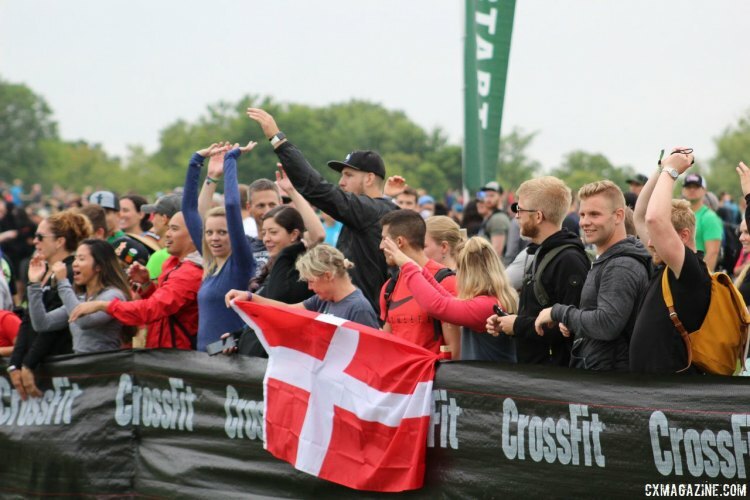 Despite all these efforts, I glanced at the CrossFit Facebook Live and Instagram comments (seriously, never read the comments) and found extensive complaining about the live stream, so is CrossFit really that different than cyclocross? 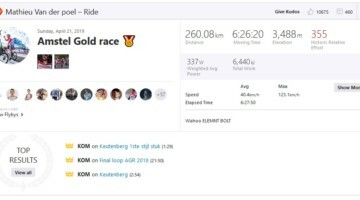 I mentioned earlier that the CrossFit athletes leaned into cyclocross on Wednesday, and on Thursday, they also went all-in on racing. Like any sport, cyclocross has nuances that take time to learn, and in the case of the CrossFit athletes, they had to learn them on the fly. It was a blast to watch the different approaches riders took to the sand pit, with some opting to ride into it while others dismounting and running right away. I was personally impressed by the dismounting and remounting skills many of the athletes quickly picked up. I remember repeatedly crashing through orange cones trying to learn how to dismount and still stutter-stepping on my remounts in the last race of my first season. 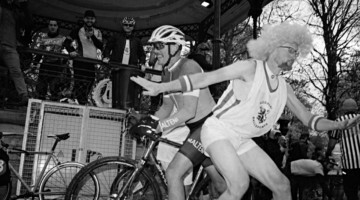 I also remember thinking how horrible it was that ten people saw me crash into a barrier at a Chicago Cross Cup race; imagine how these athletes felt trying these foreign skills in front of upwards of 100,000 viewers throughout the world? 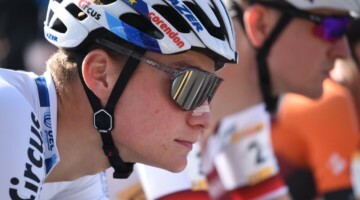 After the race, one of the women winners talked about how she picked up on strategies during the race, and Ricky Garard talked about learning how to ride his bike as a donut-craving child in Australia (h/t to Margy Robinson for catching these). My favorite conversation was with two CrossFitters who battled throughout the race because they excelled at different skills. One was better at handling while the other was better at the power sections. It sounded like a flash back to this post-race interview with two Wisconsin racers who described the exact same experience. 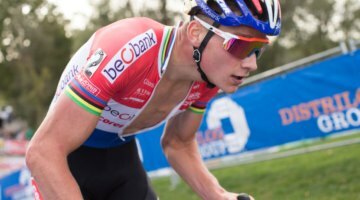 I have done my fair share of post-race interviews, and these are the stories of racing cyclocross. 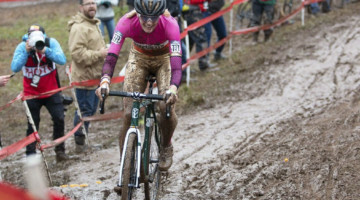 The other thing we all know about cyclocross is it is really hard, both physically and mentally. You get twenty minutes into a race and you are dreaming about Dave Towle giving you the “One to go! One to go! One to go!” Even though the CrossFit cyclocross race was about twenty minutes long, these athletes gave everything they had and in a way, it was a sign of respect for the camaraderie and challenge of cyclocross to see them give hugs to competitors and collapse to the ground after giving it everything they had. The barriers. The sand pit. 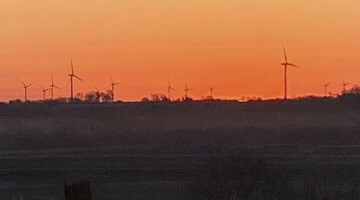 The downhill off-cambers. The logs. The gravel. The cowbell. The fun. The camaraderie. The crowds. The workout clothes costumes. This was a cyclocross race and I am so stoked September draws nigh. All of our coverage of the 2017 CrossFit Games is available here. Thank you, thank you, thank you. This article was a breath of fresh air. Your CrossFit friend mentioned that many other sports get ‘snarky’ when CrossFitters venture into them. So grateful for how you received them into your sport and drew the parallels you did. 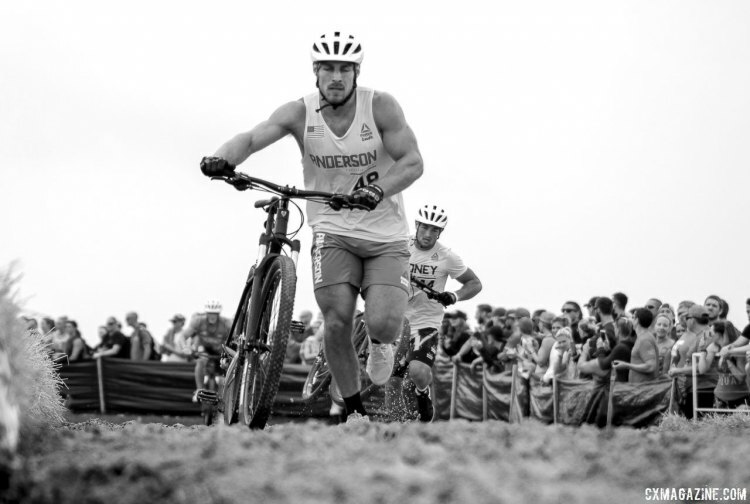 I can assure you that CrossFitters around the world were Googling ‘cyclocross’ for the first time, and that you’ve gained fans of your sport in the process. It took a long time for the weightlifting community to accept CrossFitters as legit lifters, but they’ve seen how weightlifting has thrived in the past few years with CrossFit’s influence. 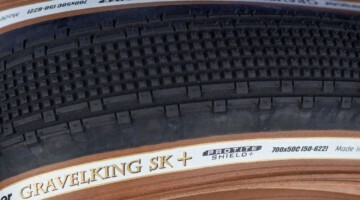 My hope is that cyclocross gets a good bump out of this years games. Jacob, thanks for the feedback. The CrossFitters were great to be around and the event was a blast. Not the first time this has happened. The former CX series in Redding, CA during 2007-2009 was sponsored and run by a local CrossFit gym. They put on a good series and had many of their clientele out racing on the weekends. Hmmmm, sounds like an interesting Throwback Thursday!